Everyone knows that less is more when it comes to luggage on a long trip. Ask any traveler on a big trip what they wish that they would have done differently, and most will tell you that they should have brought less. Overpacking is by far the biggest mistake that travelers make. And once you have all that stuff with you, the choices are limited: lug it around for the duration of the trip, give it away, or throw it out. Ideally, you should take several passes at packing for a long trip. For best results, leave your luggage alone then reevaluate your packing job on the following day. The decision to take or leave items often changes over time. If your luggage is even remotely close to full capacity, you may have a problem. Although many travelers mostly worry about weight, volume should be given serious consideration, too. A bag that takes too much effort to pack will prove to be a serious burden throughout your trip. Dirty laundry takes up far more room than neatly folded/rolled clothing. You will undoubtedly make new purchases while on a trip. Repacking your luggage for every move should not require working a time-consuming puzzle. Aim to leave home with bags only slightly more than half full if at all possible. Tip: If you travel annually, make some simple packing notes at the end of each trip. List items that weren't used so that you can remember to leave them out for the next trip. There's just something about leaving your comfort zone that flips a mental switch into survival mode. If you don't regularly use a 30-function multi-tool or an Everest-worthy travel first aid kit at home, there's a good chance you won't need them on the road. The truth is that travelers accumulate lots of useless travel-and-survival gadgets. Department stores and outfitting shops are full of fun, mostly useless things designed to tempt travelers—and to bloat bags. Unless you really are heading to the jungle in Papua or plan to wander the Himalayas independently, stay out of the "what if" mentality. It's a mindset that encourages people to add seldom-used survival gizmos. Besides, the locals in your planned destinations were getting along just fine without lightweight, titanium sporks and gadgets before you arrived. They'll most likely have everything that you need to survive. If you find yourself asking "what if" and mentally running through disaster scenarios while packing, just walk away. Knowing a little about your destination will eliminate some of the guesswork from packing. Laundry: Is laundry service available at your destination? Chances are, it is. Although doing laundry on a trip doesn't sound like that much fun, paying for service halfway through your trip means that you can carry far less clothing—a worthwhile investment. Check the weather: Knowing the climate at your destination before you go can save you from carrying around clothing and footwear that aren't appropriate for the region. Why pack an umbrella when you can just buy one if it rains? As mentioned earlier, make more than one pass at packing before a big trip. Waiting until the last minute to pack is a sure way to take too much. 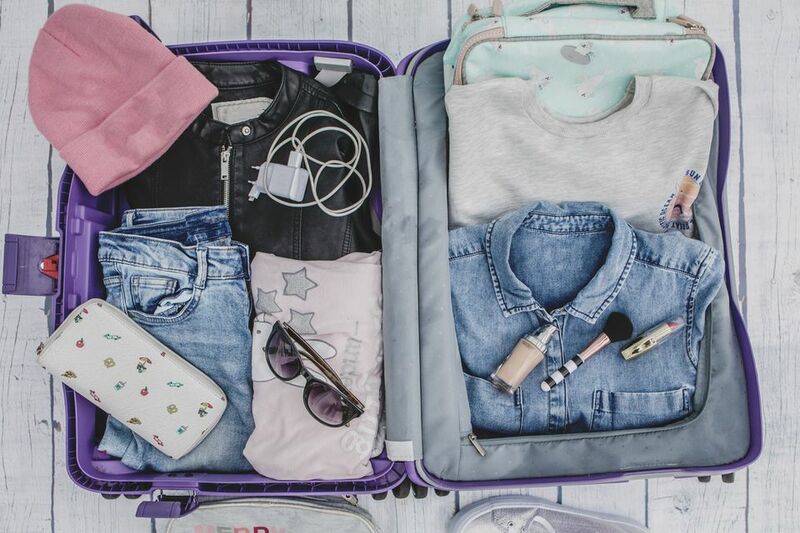 Do the initial packing, then leave your luggage alone—preferably overnight. On the second or third pass of packing, you'll probably ask yourself why you thought you needed a particular item in the first place! Before putting everything into your luggage, stage it on the bed or floor first. Not only will this give you a chance to eliminate unnecessary things from your bags, you'll have a great mental image of exactly what you brought along. In the last frantic moments before a big trip, many travelers have a tendency to stuff small, last-minute items into their bags. If nothing else, people add items just for peace of mind that the packing process is complete. After your second or third pass at packing, close and store your luggage until you depart. Doing so will help you avoid the temptation of adding more in the final hours before your trip. If you give yourself lots of room in luggage, chances are that you'll use it! Opting for a smaller backpack or suitcase from the beginning will deliberately force you to pack more carefully and efficiently. Regardless of how small a bag you choose, you still shouldn't pack it to full capacity. Tip: A waterproof day bag is a great way to protect books and electronics from harsh environments. Choose a bag that is water resistant or one that comes with a rain cover. In a pinch, the inside of a suitcase can be lined with a large garbage bag. Why fill travel-sized bottles if you're only going somewhere for a week or two? No one says you have to fill bottles—or anything—to full capacity. Get into the mindset of only taking as much as you need according to the duration of the trip. Buy more if and when you come up short on something. Put the extra effort into preliminary planning for what you will wear each day. Doing so is more productive than packing extra shirts/shoes/shorts/belts and planning to work it out later. Tip: Travel-sized toiletries and personal items definitely have a "cute" factor, but they are rarely good deals. Instead, buy a few quality travel bottles and refill them from your full-sized products. Packing is best done modularly. Try to pack in "kits" based on need. By keeping items of similar purpose together, you'll save time and energy while trying to find things later. Colored stuff sacks and compression bags are great ways to organize and save space. Consider implementing packing cubes or the ever-useful Hoboroll by GobiGear, a lightweight bag that allows clothing to be rolled and compressed. Rolling clothing actually prevents wrinkles and takes up less space. Stuff smaller objects into hollow spaces to maximize room inside of your luggage. Socks can be stuffed inside of shoes. Remove all packaging for anything new. Use makeshift cases or fashion your own ways to protect things if doing so eliminates weight. Tip: Opt for packing items into soft containers that conform rather than rigid ones to avoid dead space inside of luggage. Remember: You're going to be in an exciting new place with lots of things to see and do. You most certainly won't need as many distractions for entertainment as you do at home! Why pack cards or games when there's a new country waiting to be explored? Even carrying a smartphone, if not used with discretion, can detract as much as it adds to the experience of traveling. The well-known mantra of "pack less, bring more money" almost always holds true. Unless you're a bartering pro, cash is far more useful and flexible on a trip than physical belongings. Forgot to pack something? No worries, just buy the local version! Shopping in new places and trying local products is a big part of the fun. With some exceptions, you'll often find the same stuff cheaper in Asia, anyway. Hit the local markets—You may find something much more valuable than a good bargain: cultural insight. Unless you're absolutely positive that you won't find what you need at your destination, pack only a small quantity of everything then buy more as needed (e.g., don't take extra AA batteries, they're available pretty much everywhere. Pack only a few ibuprofen rather than the bottle, etc).